Rangzen Alliance » Will Tibetans in Exile Accept ‘Democracy with Tibetan Refugee Characteristics’? This article has been written for publication in German in ‘Tibet und Buddhismus’ issue 113/2015, to be distributed on 22nd December. ‘Tibet und Buddhismus’ (‘TiBu’) asked Neil Steedman, one of the 27 Tibet Supporter signatories of an Open Letter sent in October to the Central Tibetan Administration (CTA), to summarise his view of the responses to date. I begin by answering TiBu’s request in brief: as expected, little or no meaningful response was received from the CTA; a significant number of negative and thoughtless responses were expected from some Tibetans – but only one was received; substantial and thoughtful responses were hoped for from the wider Tibetan community – and several have already appeared and they seem to be increasing. We believe that every Tibetan has the right to hold and express their view as to the future of Tibet. The Tibetan Election Commission has recently issued rules that constrain the right to free speech and association of organisations and individuals during the upcoming exile Tibetan elections. The Election Commission has abrogated its obligation to decide – before the Preliminary vote – how many of the top vote-earning candidates in the Preliminary vote for the position of Sikyong will be allowed to stand in the Final vote, thus opening the structuring of the Final vote roster to the possibility of behind-the-scenes manipulation for political purposes. By providing means for incumbents to silence opponents before the polls open and to arbitrarily and retroactively make decisions on key rules, the Central Tibetan Administration risks becoming regarded by its people, the host nation of India, its international support base, and the international community, as an undemocratic body unworthy of trust. Even more seriously, such practices leave open the possibility of CTA posts being taken by people who become unaccountable to a free and fair popular vote and therefore able to act without the approval – or even against the will – of the Tibetan people. The continuing support for the Tibetan cause by ourselves and many others worldwide is, partly but significantly, based on the Central Tibetan Administration honouring both the spirit and practice of His Holiness’s efforts to implement true democracy in the Tibetan polity, signified by an irreproachable public trust in free, fair, non-partisan election processes. We urge you to make early (i.e. before the Preliminary election) positive responses to all our concerns outlined above. No direct reply was received from any of the three recipients. However, on 27th October an anonymous “staff writer” published an alleged “Clarification” response on Tibet.net (see display panel). TiBu readers can judge for themselves whether this “clarified” anything or, indeed, adequately addressed the eight substantive issues that were set out in the Open Letter (see www.tibet.org for the full text). In my view, it did neither. Furthermore, the penultimate paragraph asked for “understanding that…a refugee community…cannot be compared to…democratic independent countries”. Oh really? So Tibetans in exile can’t expect or demand that their Government adopts the best democratic principles and procedures – perhaps ones even better than those adopted by “democratic independent countries”? It is a minor point, but just for the record the final paragraph is (to put it politely) incorrect. We did write directly to “the concerned office” (all three of them), whereas “staff writer” did not write to us directly but chose instead to take recourse to another channel, Tibet.net. Or is this paragraph code for: “Please only raise serious issues in private and don’t keep the Tibetan people informed”? The current administration’s blatant attempts to silence opinions that they don’t like and the Election Commission’s publication of eligibility rules for final Sikyong candidates on 19th October, the day after the preliminary election had taken place, speak for themselves and are, to put it bluntly, shameful. This was a classic case of: “If you don’t like the message, shoot the messenger” and failed to address the substantive issues. Also, does he/she seriously think that anyone would send and publish such a letter without the approval of the 27 signatories? Normally I would agree with his/her view that non-Tibetans should not “stick their noses” into Tibetan politics. Indeed, for the past 27 years I have consistently and frequently argued that non-Tibetans should only support self-determination and not any particular solution, be that ‘independence’, ‘genuine autonomy’, the ‘middle way’, ‘partial autonomy’, ‘complete assimilation into the PRC’, or any other of the many self-determination possibilities (and I have sometimes been criticised for doing so). However, there comes a time when best friends must tell someone that they are behaving badly – and those 27 ‘best friends’ have, between them, given some 500 years of support to the Tibetan cause and to the CTA. There have been several thoughtful responses from Tibetans – two coming from the TCHRD. On 19th October, Associated Press published a report by Ashwini Bhatia that included: It’s just the second time Tibetans are voting since the Dalai Lama stepped down as head of the government-in-exile in 2011 to focus on his role as Tibetan Buddhist spiritual leader. “He wants us to stand on our own feet and decide about the future of Tibet,” said Tsering Tsomo, who heads the Tibetan Centre for Human Rights and Democracy in Dharmsala. Tsering Tsomo noted that Tibetan democracy was still developing. “We have the institution, but not the culture,” she said. Tsering-la is absolutely spot on! Thanks mainly to the ceaseless efforts of His Holiness, a Tibetan democratic institution is now in place. However, despite his best efforts to encourage Tibetans to “stand on their own feet”, and to have the right to hold and freely express their own opinions (a basic requirement of any real democracy), it seems that such a culture has yet to develop. Spiritual devotion to His Holiness is still regarded by many as being synonymous with having to agree with everything he says, even though he supports the separation of ‘church and state’. Tenzin Nyinjey-la is also spot on. It seems that, for the current CTA leadership, dialogue or negotiations with Chinese Government oppressors are OK, but respect for (or debates with) Tibetans holding alternative views are not. On 7th November, in Tibet Express, Tashi Shitsetsang-la published an exceptionally good article, ‘Arbitrary’ Dance of Tibetan Democracy, which included: On October 19, the EC issued a circular announcing the number of candidates to be shortlisted for the final round of the Tibetan elections. Article 67 of the electoral rules and regulations says that the EC will not shortlist less than two Sikyong candidates for the final election. In the circular, the EC added: “However, if the vote margin between the second and third candidate is less than 20% in the preliminary election, three candidates shall be shortlisted for the final Sikyong election.” This incomprehensible new rule was not a real surprise given the fact that the EC kept quiet about the number of Sikyong candidates in the final round for a long time. As part of the Europe tour, the CEC held a public talk in Switzerland on October 3 which I attended. The main goal of this tour was to raise awareness about the elections and their procedure. During the Q&A session, one of the attendees inquired whether the number of candidates for the final Sikyong round would be announced before or after the preliminaries and, if it’s announced after the preliminary election, why that would be so. Sonam Choephel Shosur, as I predicted, had no straightforward answer to these questions. He explained that there would be six Sikyong candidates for the preliminary elections but he did not mention a single word about the number of Sikyong candidates to be shortlisted for the final round. Instead, in a bid to circumvent the specific question regarding the Sikyong candidates, he said: ‘If there were ten Chitue seats, there would be 20 Chitue candidates for the final round.’ At that point I knew that issues like transparency and honesty did not matter much to the EC. I felt that, even as the first round of elections was nearing, they were still trying to fool us. Two Open Letters have also been published on Khabdha.org, one signed by 52 Tibetans in eight countries, the other by 124 Tibetans mostly from New York – both generating numerous commentaries. I do not read Tibetan, but I am told that these letters take approaches similar to, but more critical than, our own Open Letter. TiBu has also asked Tsewang Norbu-la to write an article about the post-election atmosphere within the Tibetan diaspora, so I look forward to reading his article. Short-lived Ripples or Long-lasting Waves? Will such contributions from Tibetans generate a healthy debate within the Tibetan community as to what are appropriate rules and procedures for their developing democracy? In short, will the result of our Open Letter be short-lived ripples or long-lasting waves? That will be entirely up to the Tibetan community. Either this generation is willing to accept the ‘democracy with Tibetan refugee characteristics’ now created by the current administration, or they will demand rules and procedures that are transparent and honest and which respect divergent opinions – and thereby truly respect and honour the democratic vision of His Holiness the Dalai Lama. We would like to express our heartfelt appreciation and gratitude to the Tibet supporters for their continued concern for the Tibetan cause. However, we would like to make the following brief clarifications to the group of Tibet supporters who have expressed their concerns about the implementation of the CTA’s electoral rules and regulations. 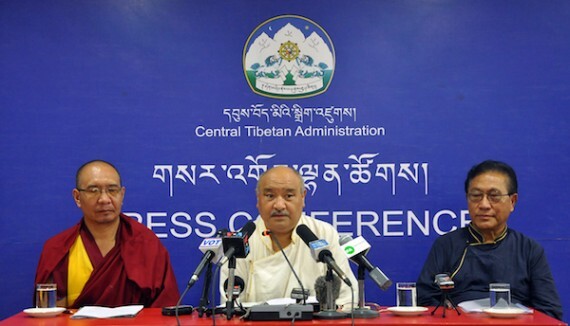 The Election Commission has implemented the electoral rules adopted by the Tibetan Parliament-in-Exile, especially Article 24 of the electoral rules, with utmost transparency. Section 9 of the article states, “During the elections of Sikyong and members of the Tibetan Parliament, the election commission should give clear directives as to the candidates, affix expenses limit by their supporters for campaigning, budgets and decorum of campaigning.” These directives of the election commission doesn’t in any way infringe on the right to free speech, association and campaign rights of any candidate, nor does it contravene any international human rights laws. The Election Commission of the Central Tibetan Administration doesn’t have the authority to approve organisations in any of its statutes. The commission recognises the eleven organisations on the basis of their having been approved by the Kashag and the Tibetan Parliament before. Therefore, we hope that you will understand that we have not made any arbitrary and ad hoc decisions. The duty of the Election Commission is to issue directives on the electoral rules and regulations, and to adjudicate in case of its violation. However, it doesn’t take suo moto cognizance, as is the norm in any function of law. We would further seek your understanding that the rules and regulations of the Central Tibetan Administration are formulated on the basis of a refugee community, which cannot be compared to the laws of democratic independent countries. In the future, if there are any opinions on the subject, do directly contact the concerned office instead of taking recourse to other channels.